After writing Seton’s first online high school economics course, John Clark wants to compliment Seton’s graduating seniors on their entertaining and technically excellent essays and their impressive thought process. Over the past three decades or so, I have worked on and off for Seton Home Study School performing a wide variety of jobs and tasks. When I first started at Seton as a teenager, I worked as a human copy collator (before copy machines had attachments that arranged photocopies into neat little groups, people like yours truly manually performed that task for hours and hours on end). In the years since, I have packed boxes, answered phones, filled orders for books and school supplies, cleaned bathrooms, printed out enrollment forms, and desktop-published textbooks. 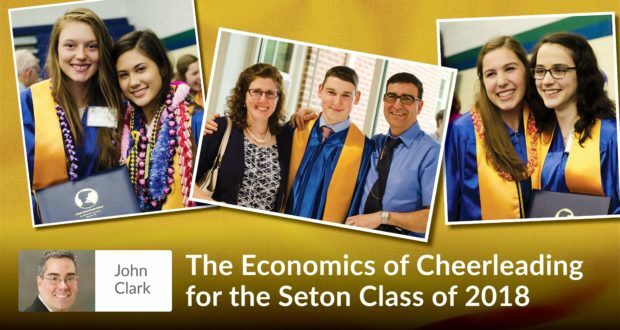 A few years ago, I was given the special assignment of writing Seton’s first online high school economics course. In short, though I’ve been associated with a school for many years, I was asked to become a teacher for the first time. The teaching of economics in America is plagued with two basic problems: first, it is as boring as sin; second, it is largely Marxist in approach. In writing the course, I hoped to change both of those sad circumstances. I hoped to convey some pretty important concepts: the beauty of God’s creation, the joy of material detachment, man’s calling to practice both justice and charity in the workplace—in short, things that most economics courses fail to consider. With the help, dedication, and perseverance of some very talented Seton staff members, we finished the course a couple of years ago. I have graded all the Economics essays that you seniors have submitted over the past year, and I want to tell you something: you have done remarkable work. Your essays have been very entertaining and technically excellent. In fact, many of these essays were of professional quality. Moreover, your thought process is impressive. Clearly, you Economics students have been thinking. Though I have enjoyed being a teacher for my own children for a quarter-century, you students have increased my love of teaching. Thank you for that. Thanks for teaching me about teaching. Thanks for letting me learn with you. I also want to thank you for your kind words for me and for the economics course over the past year or two. After its introduction, Seton took a survey asking students and parents for feedback about the course. In the aggregate (as you young economists might put it), the response has been very positive about the course and incredibly kind about me. One parent even told me that her son often laughed out loud while taking the course and couldn’t wait to get up in the morning and study his new economics lessons. Not bad for what is often referred to as the “dismal science.” Not bad at all. This year, just like every year, I’ll be at Seton’s graduation in Front Royal to congratulate you. But this year, for the first time, I’ll be there as a Seton teacher. Thank you for that. I am proud to have been your teacher. And when you walk up to the stage to get your diplomas, you’ll hear me. I’ll be cheering louder than ever.